It is indeed a pleasure to write a foreword for this spectacular book which represents a landmark in the history of ocular pathology. Not since the three volumes of the Henke-Lubarsch handbook appeared forty years ago has anything like this come on the market. This book represents a compre­ hensive, thorough and up-to-date clinically oriented textbook on ocular pathology. We are all indebted to the senior author, who is now professor of ophthal­ mology at the University of Erlangen, who presents us here with the fruit of decades of industrious endeavors. 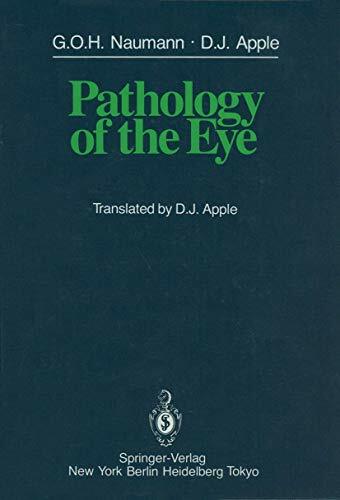 We also have to be grateful to the American ophthalmic pathologist, Dr. David Apple, who, as one of the main collaborators of the German edition, has now provided us with the English translation. The book has a twofold purpose: First, it is meant to be a source of instruction for ophthalmologists and pathologists. For that purpose it is beautifully illustrated both by clinical pictures and by excellent photomicro­ graphs and electromicroscopic pictures. Most valuable from a didactic point of view are the colored schematic drawings and the many tables. These two features are practically unique and should help any neophyte in grasp­ ing the principles of ocular pathology.